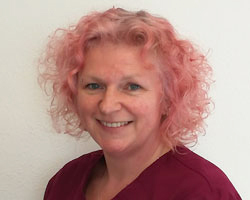 Justine started working at the practice in August 2018; she is a hygienist at 2 other dental practices in Leicestershire including Priti Thanasi’s practice in Syston since April 2017. She qualified at Cardiff University in 1997 and is a member of the British Society of Dental Hygiene and Therapy. Justine has worked in a variety of practices and community dental settings and provides treatment with a thorough and gentle approach. She lives with her partner and three children and, given the chance, enjoys walking and cooking.